Click on map for a detailed townland index map . . . . Known locations other than official townlands where the geographical location is known. 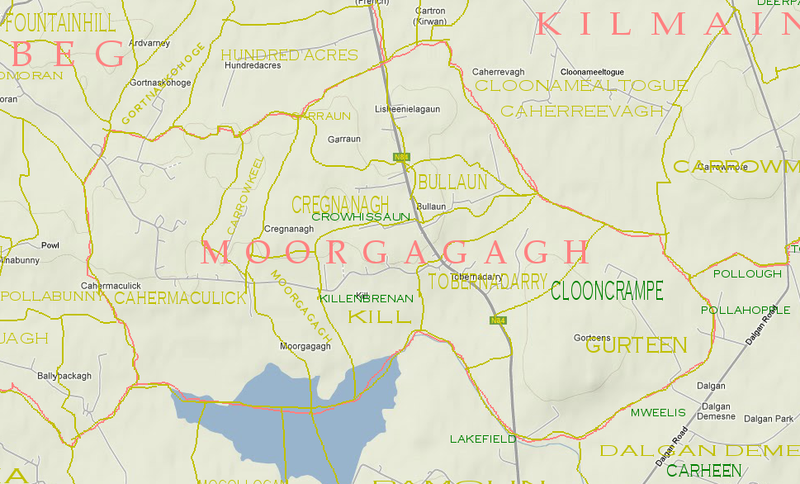 A parish, in the barony of KILMAINE, county of MAYO, and province Of CONNAUGHT,5 1/5 miles (N.) from Headfort, on the road to Ballinrobe; containing 518 inhabitants. The parish comprises 1362 statute acres of arable and pasture land. It is a rectory and vicarage, in the diocese of Tuam, forming part of the union of Kilmainmore : the tithes amount to �55. In the R. C. divisions it is part of the union or district of Kilmain. There is a private school, in which are about 160 children. From the fine ruins of the abbey of Kill, part of the possessions of the Benedictines in the 12th ,century, situated near the border of a small lake, an extensive and interesting view is obtained. B.S.S.M. :: Mór Gágach, split or chinked wall or house. This name is said locally to be the original name of the old church, which stands in ruins in Moorgagagh td., and which is said to have obtained the epithet Gagach from having its walls split by the heat of the sun. The word Mór, which is cognate with the Latin Murus, signifying a wall, was used by the ancient Irish to signify, not alone a wall, but a house or castle. For example, Mur Ollamhan, the House of the Ollavs, at Tara, and Mur na mBrathar, the douse of the Friars, at Donegal. This parish is situated in the east side of the barony of Kilmaine. It is bounded on the N. by the parishes of Kilmainemore and Kilmainebeg; W. by the ph. of Kilmainebeg; S. by Shrule parish; and E. by the phs. of Shrule and Kilmainemore. It contains 1,789a. 1r. 5p., statute measure, of which 86a. Or. 4p. are water. It is a rectory and vicarage in the diocese of Tuam, and its tithes amount to £55. In the td. of Kill are the remains of an old abbey. Loch na Cille, the lake of the church. Situated on the southern boundary of the parish, and on the northern boundary of Shrule parish. This lake is almost dry in the summer season. Loch Laoigh, lake of the calf. This lake is situated on the southern boundary of the parish and of the td. of Gorteens.